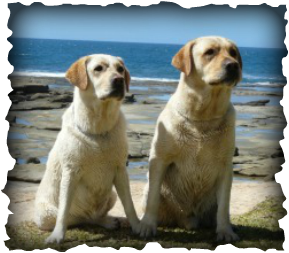 Miandor is a small family orientated kennel exhibiting pedigree Labrador Retrievers of quality in type and temperament. Our special interest lies within the conformation ring. However, we take pleasure in acknowledging the versatility of the Labrador Retriever and encourage them to excel in their chosen fields. Be they family pets, companion, trial, obedience, agility, therapy, assistance or conformation show dogs, our Labradors are ready to be all that is desired of them. The health and wellbeing of our Labradors is first and foremost, and as such we take care in ensuring that our labradors are raised, and continue to live, in a quality environment that is safe and stimulating for their active minds and devoted hearts. We pay special attention to diet, exercise, play, responsible breeding practices, and giving lots of cuddles! Michelle was raised on a horse stud by her parents who have simultaneously run a successful small/large animal Veterinary practice for the past 40 years. Ethical and attentive animal husbandry has been both second nature and highly important in the care given to all animals. Michelle's childhood through to young adult focus was initially on the breeding, training and showing of Western Performance Horses where she achieved many State and National Championship successes. The requirement of structural soundness and workable temperaments with the horses has carried over in to the breeding program with the Labrador Retrievers. James grew up with pedigree English Springer Spaniels. He has always had an interest in pedigree dogs, and particularly gun dogs, and believed it was important to pursue a pedigree breed when the decision came to acquire the first of what was to become Miandor Labrador Retrievers. He has a natural eye for 'balance' and clean lines - which means he wins many 50c bets amongst the spectators at the shows when he gets them all in to pick their winner from the sideline! We became members of Dogs Queensland in 2005 with the purchase of our first Labrador Retriever 'Maple'. The cross-over from show horses to show dogs was probably inevitable! As the show bug bit the kennel expanded to include a small, yet successful number of quality Labrador Retrievers sourced from reputable breeders and highly proven bloodlines. We have enjoyed the challenge of producing our own quality puppies and find nothing more humbling than watching one of our own puppies grow from birth all the way through to holding their own in the show ring. We also enjoy seeing the babies we don't choose go off with their forever families and bring them immense joy, and at times we have had puppies go forward as Qualified Assistance Dogs, Make A Wish or as School companions. It's an absolute honour to be able to be in this position and it makes all the hard work, heartaches, and joys all worth it. We have celebrated many successes at both All Breeds and Speciality shows including many Class in Show Speciality wins, and a Best in Speciality Show award as well as Class in Show All Breeds and a Best Exhibit in Show All Breeds. It has been a thrill to be recognised by both National and International Breed Specialists. Our showing opportunities have been limited at times by the need for long spells while careers and human babies have been factored in. We feel passionately that there is still so much more for us to achieve and the desire to continually improve, learn and grow with our understanding of the breed and our breeding program motivates us every step of the way. We welcome you to our site and the lives of our Labradors. We hope that you too share our enjoyment of our delightful dogs as you browse our site. If you require further information, or wish to enquire about litters that we have advertised or enquire about stud dogs please feel most welcome to contact us. has 3 recognised colours - (Black, Yellow and Liver/Chocolate). Breeders promoting any other colour in a pedigree Labrador Retriever are in fact advertising a cross-breed between a Weimaraner and a Labrador. DO NOT GET SCAMMED BY SUCH "BREEDERS"
Please help us to protect the integrity of our breed by reporting any suspected breeders of Silver Labradors. Every Cloud does have a Silver Lining! Going BOB and Open in Group straight up! She is also now an Australian Champion!!! Gains her Australian Champion Title! Straight in to the Spotlight! At his very first Outing!! We wish you all another fabulous year ahead!